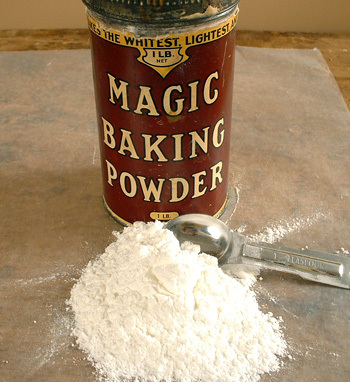 Baking Powder is Baking Soda to which an acid and a filler are added. Once you add a liquid, it springs into action and causes chemical leavening of your baked good. Chemically, Baking Soda is the “base” (or alkaline) and another dry substance such as Cream of Tartar is the “acid.” When moistened, the two will go “into solution” and react with each other, producing bubbles of carbon dioxide. Unlike Baking Soda, Baking Powder does not require a liquid acid (such as sour milk) to react with because the acid is already in it. This gives cooks more freedom of choice over the liquids they want to use. The third ingredient, the filler, helps keep the Baking Powder dry, so that it remains free-flowing and so that the base and acid don’t get moist and interact in the container. The filler also provides a bit of bulk to make the powder easier to measure. Cornstarch is the most common filler. 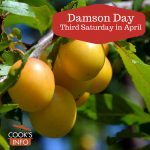 It will be listed as the major ingredient. There are actually 6 different types of Baking Powder. This class of Baking Powders uses Cream of Tartar and tartaric acid as the dry acid in them, which react quickly when a liquid is added. Baked goods made with this type of Baking Powder must be cooked quickly before the carbon dioxide has a chance to escape or the baked goods will go flat. For the dry acid, this class of Baking Powders uses calcium phosphate or disodium pyrophosphate. They react with liquid a little more slowly than tartrate. Sodium aluminum sulfate (SAS) Baking Powders use sodium aluminum sulfate as the dry acid. SAS reacts very slowly at room temperature, and doesn’t really get going until it is heated. This means that most of the gas bubble production gets saved for the oven. Too much SAS, however, can give a bitter taste. For this reason, SAS is often used is very small quantities to enhance a Baking Powder that uses one of the above dry acids. This is a basic Baking Powder: Baking Soda plus filler plus one dry acid, which will usually be Cream of Tartar, though a phosphate might be used some times. It releases carbon dioxide bubbles as soon as it is made wet in the mixing bowl. You need to get your batter or dough in the oven with no delay and cook the baked good quickly, before the bubbles have a chance to escape. This is the most common and popular kind. If a recipe calls for Baking Powder, assume it means double-acting. Double-acting is like single-acting, except it has two dry acids instead of just one. The first acid reacts with liquid during the mixing. The second acid is one that is chosen because it will save its reacting for when it is heated, so you get a good burst of leavening happening in the oven in addition to that which happened in the mixing bowl. That second acid is sodium aluminum sulfate (SAS.) Because you get two “reactions”, this is called “double-acting. With double-acting Baking Powder, you have a window of about 15 to 20 minutes to finish preparing your baked good batter or dough after the Baking Powder is added before you must whistle it into the oven. This gives cooks a bit more flexibility. The reason recipes using Baking Powder will usually have you mix all the dry separately and all the liquid separately and then combine is so that the reaction process in the Baking Powder won’t get kicked off until the very end. The recipes will also tell you to mix the dry and wet together just until blended, and not any more: over-mixing will let all the gas bubbles being formed escape. Even with the advantages of double-acting Baking Powder and its second reaction that will occur in the oven, you still don’t want to lose the benefit of the first reaction that occurred in the mixing bowl when the liquid was added. For this reason, you never mix up doughs or batters using Baking Powder hours in advance. Generally, the ratio of Baking Powder to flower is roughly 1 – 2 tsp Baking Powder to 1 cup / 5 oz of flour (or 5 – 10 g to 140g). For any of the above substitutes, treat them as “single-acting”; get the batter in the oven or the pan right away. Calcium aluminum phosphate use is now being phased out, owing to current beliefs that aluminum may be bad for us at much lower levels than was previously known. Store Baking Powder in a cool, dry place. Manufacturers seem to advise that once the Baking Powder container is opened, it will have a shelf-life of 6 months to a year, but many people use opened tins of baking powder over the course of several years, and never have a problem with it not working. In the 1850s, manufacturers switched from Cream of Tartar to a calcium aluminum phosphate, because though it still started to react in the mixing bowl, it waited just a bit longer. At the same time, stores started selling self-rising flour — flour with Baking Powder already mixed in. In 1885, sodium aluminium sulphate (SAS) was discovered. Baking Powder manufacturers switched to using SAS because of its ability to hold off the reaction until the baked good went in the oven. Calumet Baking Powder came on the market in America in 1889. “Few realize that the first type, the cream of tartar baking powder, has practically disappeared from the market. Combination baking powder now dominates the field. It contains phosphates and aluminum as do our natural foods. The essential facts regarding this efficient and wholesome product are told clearly in this book.” — Juanita E. Darrah. Modern Baking Powder. Chicago, Illinois: Commonwealth Press. 1927.